Inspired by artwork! I had to take many many art history classes in college, and there were a lot of artists that I really wanted to emulate on this one! However, I didn't think that my skills were at a high enough level to be able to do them justice and translate the style well to the nail. 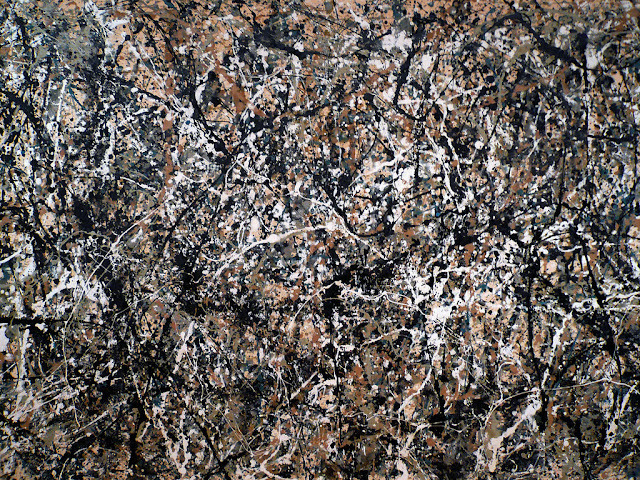 There was one artist, though, that I thought would be perfect for nail art: Jackson Pollock. 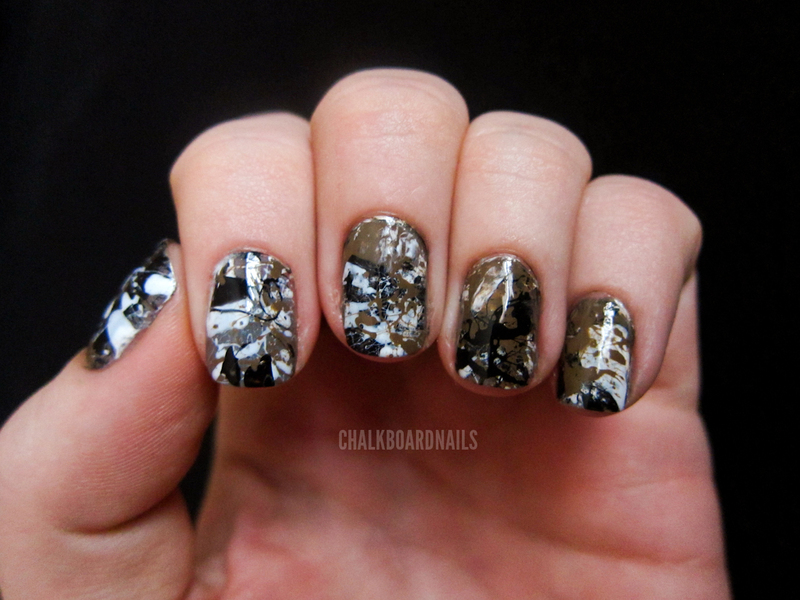 Here's the mani that I ended up with, with the inspiration painting inset. The painting is called One: Number 31. It lives at the Museum of Modern Art in NYC. Here's a larger view of the painting alone. My colors weren't perfect, but I did what I could with what I had and I think it still captures the spirit of the piece. I started with a base of China Glaze Recycle (which got completely covered). Then, using multiple straws, I splattered on different layers of China Glaze White On White, OPI A-Taupe the Space Needle, and Wet N Wild Ink Well. 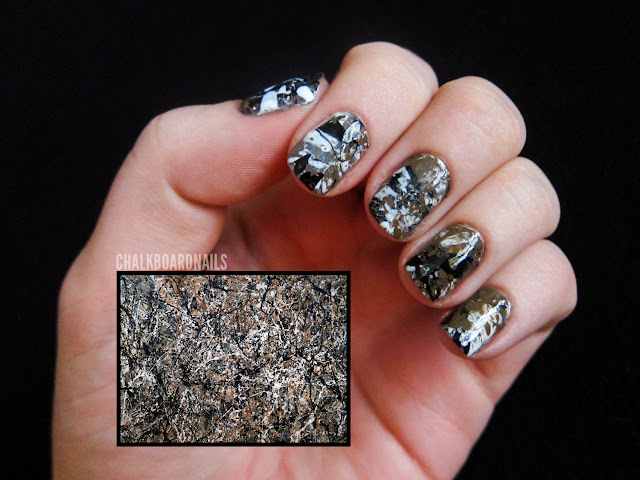 The splatter technique is done by dipping a straw into your polish bottle, and then blowing the polish on to your nail from a distance. COVER YOUR WORKSPACE WITH WAX PAPER!! This is a messy technique, and I don't want you to ruin your table trying it! I learned that the best way to get a real splatter instead of just blobs of polish on your nails is to use short and hard breaths when blowing the polish on to your nails. I love this!!! Have never seen this art before-not really into art but love this and the colors-you really are awesome!! Wow, that's amazing! Great color choice! 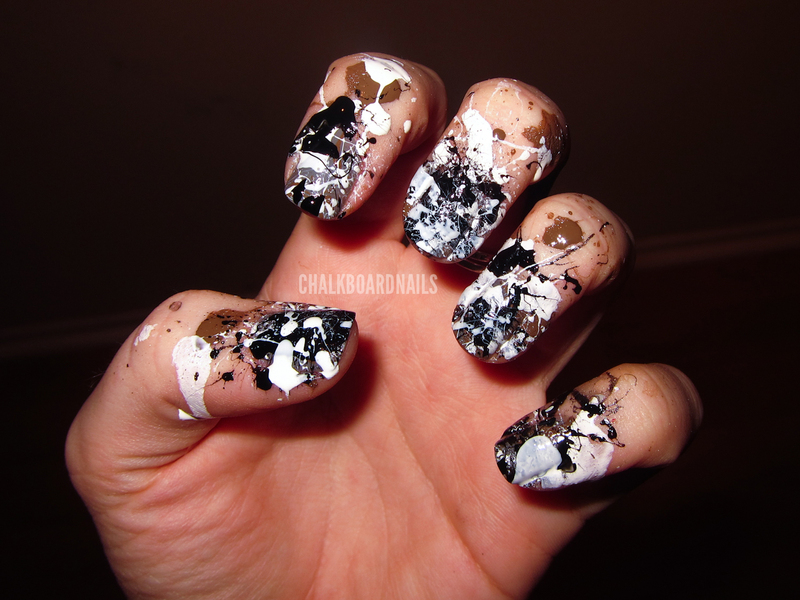 I actually just did a splatter mani myself! Cleanup is a pain in the arse, but the result is so cool! @Elizedge - Haha, I just went for the straw method, I didn't know there were other methods out there! The sponge one you posted is cool! This is great, very cool looking. 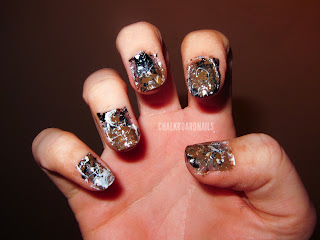 seriously... my new fave nail blogger. I really like your index finger and you did a wonderful interpretation of the painting! oh my goodness that must hav been a pain to clean!!!! Looks great though! You did an awesome job! You nailed the colors. This is dope and I never thought to use the straw for the splatter. thanks! OMG LOL @ your first try....what a mess!!!!!! I can now say I have learned from your mistake lol. I haven't tried spatter yet but I bought some straws to do it. I have two sizes...regular straws and the tiny coffee stirrer straws. Have you ever tried doing the splatter with the tiny ones? Nope, I've only ever used the regular ones! I've heard of people using the small ones with good success though.